One of the stops on our Walla Walla wine trip two summers ago was Forgeron Cellars, where winemaker and managing partner Marie-Eve Gilla gave us a splendid introduction to her winery. We learned while there that her husband, Gilles Nicault, was involved with another local winery, Long Shadows, but the name didn’t mean much to us. Nine winemakers. Nine hats. The nine renowned winemakers of Long Shadows’ signature wines discover after each harvest that a percentage of their resulting barrels are more than they require to achieve that perfect balance in their final blends. These extra barrels now produce NINE HATS…wines of complexity and distinctive character. wine that immediately caught my eye was Saggi, produced by one of the Long Shadows winemakers. Just a week ago, we were given a bottle of Nine Hats Sangiovese. In reading up on it, I learned the story behind Nine Hats and Long Shadows. … [Quote above.] … Reading further, I discovered that the “signature wine” corresponding to the Nine Hats Sangiovese is the Saggi, a Sangiovese, Cabernet Sauvignon, Syrah blend. I thought—last week, this is—that we might enjoy trying both and comparing. First we would try the Nine Hats. If we liked it, we’d look for the Saggi. But here it was, a 2008. No looking required. I put the bottle on the counter to buy. It was months before we tried another Long Shadows wine. 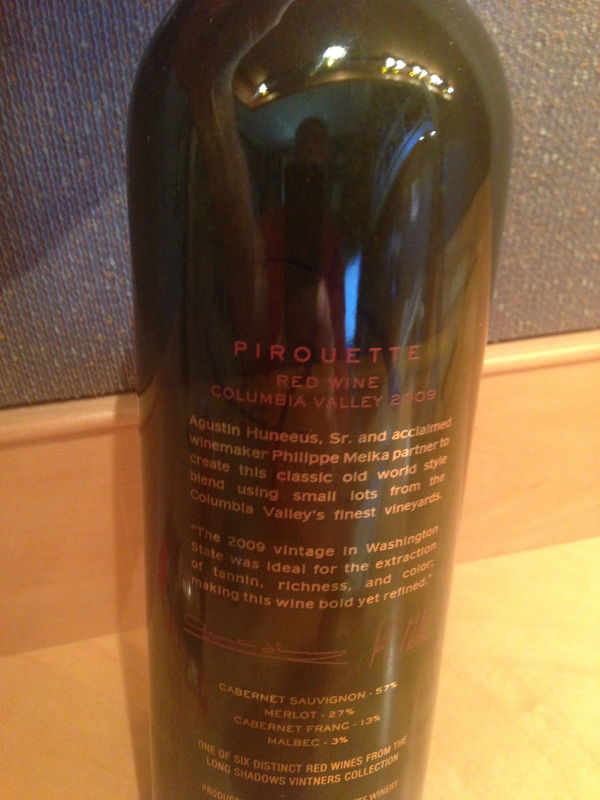 Our local grocery store had a bottle of the Pirouette, which we bought last spring but didn’t drink until our Yom Kippur pre-fast dinner in September. I devoted a post to it, prompting me to learn more about Long Shadows. Let me quote from that post. Founded in 2003, Long Shadows is the brainchild of Washington wine luminary Allen Shoup. As president and CEO of Chateau Ste. Michelle and its affiliated wineries, Allen spent 20 years building the reputation of the growing region … . With the vision in place, Allen began by introducing a dream team of celebrated vintners to the vines and wines of the growing region. The idea quickly sold itself; and from the beginning, the wines have enjoyed critical acclaim that has continued to grow, vintage after vintage. The Pirouette is made by Philippe Melka and Agustin Huneeus. Philippe Melka and Agustin Huneeus, Sr. teamed to combine the traditions of old world winemaking, the advancements of new world technology, and small lots from Washington State’s finest vineyards to craft this enticing red blend. The 2009 is a blend of 57% Cabernet Sauvignon, 27% Merlot, 13% Cabernet Franc, and 3% Malbec. Oh, right, it says so right there on the bottle, pictured at the top. I really didn’t need to add much. The bottle just about says it all. What the bottle doesn’t say is that it was as fine a bottle of wine as we have drunk in ages. Unfortunately, we bought just the one, and they’re now sold out. Perhaps we should invest in the 2010. It was around that time that I signed up for the Long Shadows mailing list, subscribers to which learn about and are offered the opportunity to order each of their new releases. I also discovered that Long Shadows had a tasting room in Woodinville. If we ordered some wine, we wouldn’t have to drive to Walla Walla or pay for shipping (and be home to sign on delivery). Gail and I could just drive up to the tasting room. Please join us at our Woodinville tasting room to unwind for the weekend and enjoy a sampling of our wines. Choose from a selection of small pours, by the glass, or by the half bottle. With live music from [name of musician or group] to help kick off the weekend. Well, resist we did, for months. The drive out to Woodinville after work on a Friday never seemed all that enticing. Then, a couple of weeks ago, Long Shadows sent out an email announcing special Valentine’s Day events at both the Walla Walla and Woodinville tasting rooms. Gail and I agreed that this would be our opportunity to get up there. Only later did I realize that the Valentine’s event was just the usual Unwine’d evening, with dessert options thrown in. Still, we planned on going. Last Tuesday, three days before our planned outing, Long Shadows sent out an email to the list announcing the establishment of a wine club. As many of our current releases are selling out quickly, some of our customers are discovering it is difficult to find our wines. We are excited to offer new supporters the opportunity to have guaranteed access to their favorite Long Shadows wines by joining our Winery Key Club. As a member you will be assured early notification of all regular releases, with special pricing included. You’ll also receive complimentary admission to release events, VIP experiences at the winery and tasting rooms, priority access to library wines, large formats and gift boxes, and other exclusive benefits available only to our valued club members. If you have been interested in our wines but were waiting for the right opportunity to discover them for yourself, Key Club membership is a wonderful way to begin your relationship with Long Shadows. Perfect. There were three club levels, as described in the email and also at the website. The lowest level offers two shipments a year of six bottles each, with 10% discount on those and any other purchases, pick up available at either tasting room or shipping at extra cost. 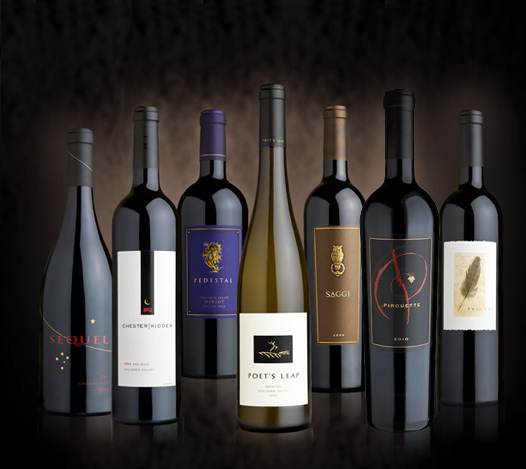 Other perks were listed with the parenthetical comment “as available.” By stepping up to level two, we would get three shipments a year of six bottles each—three bottles of each of their six red wines—with 15% discount on those and other purchases plus guaranteed access to events, library wines, and so on. I signed up that night. Political blogs in our nation’s capital are buzzing with the choice of wine for tonight’s State Dinner at the White House for French President François Hollande, and Washington state will be represented by Long Shadows Vintners‘ 2009 Chester-Kidder from the Columbia Valley. Politico.com reports the other two wines being served by President Barack Obama’s culinary team are Morlet 2011 La Proportion Dorée from Napa Valley and Thibault-Jannison Blanc de Chardonnay from Monticello, Va. Dinner entertainment will feature pop singer Mary J. Blige. Dylan Byers of Politico.com poignantly pointed out the French connection at Allen Shoup’s rockstar winery in Walla Walla. The affable and talented Gilles Nicault has overseen the production at Long Shadows from the start. And while he works alongside such world-renowned winemakers as Armin Diel (Germany), Randy Dunn (Napa), John Duval (Australia), Ambrogio and Giovanni Folonari (Italy), Philippe Melka (France) and Michel Rolland (France), the Chester-Kidder brand is a separate collaboration of Nicault and Shoup. Shoup spent 20 years at Ste. Michelle before retiring as CEO in 2000. Soon after, he developed Long Shadows and one of his first moves was to hire Nicault in 2003 from famed Woodward Canyon, where the graduate of the University of Avignon had worked seven years for Rick Small. Nicault made wine in Champagne, Côtes du Rhône and Provence before he arrived in the Yakima Valley in 1994. He worked for Staton Hills and Hogue Cellars before landing a position with Woodward Canyon. The first vintage of Chester-Kidder was 2002, and the blend is a tribute to Shoup’s grandfather, Charles Chester, and grandmother, Maggie Kidder. The 2009 Chester-Kidder ($50) will be paired with Dry-Aged Rib Eye Beef served with Jasper Hill Farm Blue Cheese Crisp, Charred Shallots, Oyster Mushrooms and Braised Chard. That vintage of Chester-Kidder was a blend of Cabernet Sauvigon (50%), Syrah (28%) and Petit Verdot (17%) using grapes from Candy Mountain near West Richland, Wash., and StoneTree Vineyard on the Wahluke Slope. Production was 989 cases. Between joining the club and learning about the White House dinner, we were even more excited about our Valentine’s plan. Then again, by joining the club, we had signed up for regular visits to the tasting room to pick up our wine, so getting up there that Friday night was less urgent. This is the quandary we faced when I got home from work Friday afternoon. And didn’t we need dinner anyway, not dessert? Finally, around 6:30 PM, we headed out. The unwine’d evening ran from 6:00 to 9:00, so we had some time and really needed a meal. But not too much time. What to do? Burgermaster!, It’s a beloved Seattle-area institution with a charming drive-in site in Bellevue, just off State Route 520, the road we needed to take to get to I-405 and up to Woodinville. One might not have guessed, but the drive-in turned out to be quite the Valentine’s Day hangout. Boy was it crowded! We ordered, ate a most satisfying meal in the car, and headed out. Fifteen minutes later, we were lost in Woodinville. We headed up 202, the Woodinville Redmond Road, coming to a traffic circle just north of which was a concentration of winery tasting rooms and other commercial establishments. But where was Long Shadows? There was Brian Carter Cellars, off to the left, and more wine rooms in a strip mall just north of it. To the right was a Mexican restaurant, Mazatlan, and more wine rooms, some with well-lit signs, plus a sign along the road listing Mazatlan and the wine rooms but not Long Shadows. We drove past, then back south, way south on discovering no good place to turn around, then back north, then finally into the crowded parking lot on the left, even though I knew from the address that Long Shadows should be to the right by Mazatlan. We got out, crossed the street, wandered toward Mazatlan, passing a crowded room with small unlit signs high up on the walls. A guard was in the parking lot, so I asked where Long Shadows was. It was the crowded place, and when we got close enough, it turns out that the sign I couldn’t read said “Nine Hats.” Another sign said Long Shadows. Unreadable though unless you’re close. How would we have known, especially given that neither they nor Nine Hats was listed on the big sign along the street that had all the other establishments? No matter. We had arrived. We walked in, went to the counter in the back, past people sitting and standing, with featured artist Billy Brandt singing and a small jazz band backing him up. At the counter, we were given menus. You could choose any of the six Long Shadows wines, $12 each, or order from a small dessert menu. I asked if we could buy bottles using our new club membership. Sure, 15% off. And we had privileges in the private tasting room in the back, though nothing was being served back there. John Duval, formerly of Australia’s iconic Penfolds Grange, chose the Columbia Valley as his “Sequel” for the continuation of his life’s work with Syrah. Cool spring temperatures delayed flowering and reduced fruit set, while the summer temperatures remained moderate. In response to these conditions, we opened up the leaf canopies and dropped clusters so that the vines were well positioned to finish ripening when the warm weather arrived in the fall. The 2010 vintage was a cooler than average growing season that produced bright, fresh wines with excellent acidity, color, flavor and varietal character. Deep and inky in color with vibrant aromas of wild blackberries, crushed rock, smoked meats and spicy oak. Concentrated dark fruit flavors are accented by a savory mid-palate and excellent acidity that provides a seamlessly balanced finish. Syrah from Yakima Valley’s Boushey Vineyard (40%) gives Sequel its bright, fresh fruit character. These grapes are the perfect complement to the dense, dark fruit grown at Bacchus Vineyard (23%), from one of the oldest Syrah blocks in the state. Grapes from Candy Mountain (26%), adjacent to Red Mountain, give the wine its backbone. The remaining Syrah is grown at Sonnet Vineyard at The Benches in the Horse Heaven Hills, planted to a Shiraz clone that John recommended for its dark, rich and complex character. Dionysus Vineyard Cabernet Sauvignon contributes structure and adds to the wine’s appealing mid-palate. Glasses in hand, we wandered into the back room, then returned to stand at a counter supported by two barrels, then grabbed two seats at the end of the bar and focused on the music as we drank an outstanding wine. The set was soon over, and Billy, the singer, headed toward us to start up a conversation. It turns out he’s from Boston. I mentioned that I lived there for twelve years and soon we were talking college hockey. He played on Boston College’s JV team one year (BC is currently ranked #1 in the country, was national champions three of the last six years) and described his career highlight scoring a goal against Harvard in a preseason game. If not for Billy, we might have finished our wine, bought some bottles, and left. But now we wanted to hear his next set, so we stuck around. Gail bought a glass of the Chester-Kidder, allowing us to taste what Obama and Hollande had drunk three nights earlier. I had just a sip, and without benefit of dry-aged rib eye beef, but I imagine they were happy with it. With a bottle of Pirouette at home, we decided to buy the other five Long Shadows wines, using our new 15% discount. We paid, listened to some more music, then headed out between songs, with Billy calling out our names and saying goodbye as we exited. Back home, we read up on Billy. Having an affinity for the bluer side of jazz that rocks as much as it swings, Billy tends the musical bar with playful and wise originals and standards. A smooth and smoky voice with a swingin’ jazz combo mixes a delicious melodic libation best served up or on the rocks. Bringing his New England background to the fore against the breathtaking backdrop of the Pacific Northwest, Billy entertains audiences drawn to his humor and storytelling. While immersing himself in the rich music community of Seattle, Billy has played at Tula’s, the Triple Door, the Columbia City Theater, Egan’s, Lucid, and the Paragon. He’s also busy writing songs, collaborating, and producing shows such as the popular annual The Big Gig (of which there have been four; the last two sold out the Triple Door). With style and showmanship that is warm and easygoing, possessing a hint of swing and a blues sensibility, Billy is sure to charm as he celebrates the release of his first album, The Ballad of Larry’s Neighbor. Here’s a video of Billy just last month at Seattle’s Triple Door. We saw him on Friday singing with a guitarist, upright bassist, and drummer. We look forward to seeing Billy again. He mentioned that he’s at Long Shadows about every six weeks. Indeed, we’ll be happy to return to unwine’d on any Friday, regardless of who’s playing. Maybe next time we’ll eat at Mazatlan first. Even with Burgermaster, it was a lovely evening. I read a great piece yesterday by Pat Jordan, one-time pitching prospect turned writer, in which he describes a visit to old friend Tom Seaver, one-time pitching great turned winemaker. Seaver and his wife, Nancy, live in Calistoga, California, where they run Seaver Vineyards. Seaver Vineyards produces Cabernet Sauvignon in limited production of between 400-500 cases per year. Grown on a south facing slope on Diamond Mountain, our wine is made from 3 different clones (a 4th clone planted in 2009 will be incorporated into the 2011 vintage) grown on our 3.5 acre vineyard. The 2005 vintage was our inaugural vintage, released in 2008. Beginning with the ’05 vintage we have offered two bottlings of our Cabernet, GTS and Nancy’s Fancy, mainly because the characteristics of the grapes grown on the smaller hill of the vineyard have been very different than those grown on the big hill. 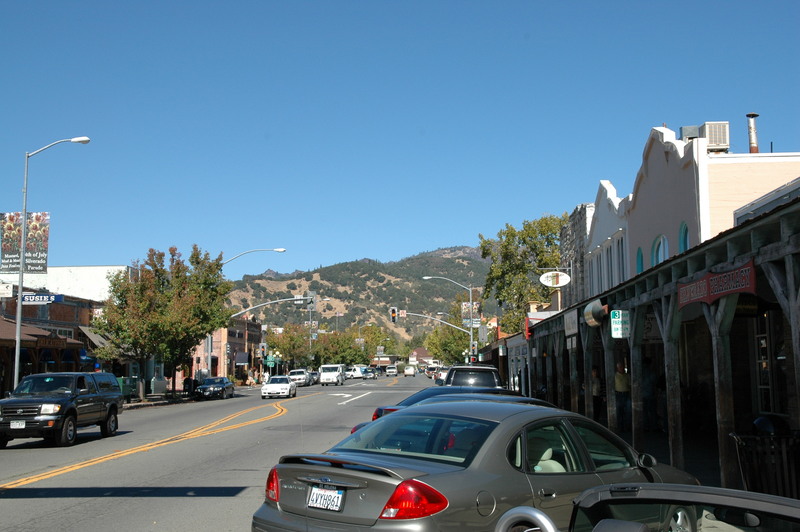 We were in Calistoga in October, 2008. On the last full day of our visit to Healdsburg, which lies across the mountains in Sonoma County, we decided to venture over to the Napa Valley between winery visits. It was a beautiful drive, bringing us down into Calistoga, where we ate lunch, then visited the Sharpsteen Museum of Calistoga History. (I took the photo up top as we were getting back in the car after lunch to drive around town, stumbling on the museum during the drive.) As I read Jordan’s description of the Seavers’ home on Diamond Mountain, I imagined that I had looked up at it from town. The Jordan article has many delights, even for readers who aren’t baseball fans, though especially for those who care about baseball. Seaver’s insights are fascinating. It’s a surprise to realize that Seaver didn’t make all that much from his baseball days, despite being one of the greatest pitchers ever. He did well, of course, but an order of magnitude less well than today’s stars. He wasn’t a multimillionaire buying an existing successful venture as a hobby. Rather, he bought undeveloped land and made a go of it from scratch as a real business. I hesitate to quote from the article, as I don’t want to spoil its pleasures. Go read it. We’ve been sitting on a bottle of Long Shadows Vintners’ 2009 Pirouette for a while, finally finding the occasion two Fridays ago to open it. Andy and Cynthia were here to join us for a pre-Yom-Kippur dinner, which warranted a good bottle, and the Pirouette was it. In early February, I wrote about Quilceda Creek Vintners, whose “private member” list we had signed up for some time in the past and then forgotten about. Thus, the email from Quilceda Creek in late January announcing the upcoming release of their 2010 Cabernet Sauvignon Columbia Valley took me entirely by surprise. Come February 7, I logged on to Quilceda Creek’s website early and ordered three bottles. Two options were offered: shipping, or onsite pickup during the March 16-17 weekend, when the winery would be open to members for not just pickup but also a tasting of the new wine. I chose pickup, which I soon learned was even a better idea than I imagined. For, Russ would be attending, as would sister Robin, my as-yet-unmet super-cool e-pal, in from Hilo for their brother’s wedding. The wedding was yesterday. Quilceda Creek pickup today. Alas, Gail was called away at the last minute on urgent business, so I had to go without her. The winery is set in a mostly semi-rural area about 32 miles north of us, but right at the opening to an unexpected residential development. I parked just off the road, walked in through the gates, and checked in at a table. Then I entered one of the winery buildings, devoted largely to events such as this. I was handed two tokens, one good for a glass of the newly released 2010 Cab and one for a glass of the 2010 blend to be released in the summer. Also a ticket, for dessert. And I was handed a wine glass along with a paper plate that had a slit to accommodate the glass stem. Along one wall, two men were pouring the cab. Across the way on the opposite wall, a man and a woman were serving the blend, and there was also a tray with tiny paper plates, each holding a slice of duck. A third wall had a cheese spread. The fourth wall, or the location that would be the fourth wall, was a large doorway leading into a darker room with wine barrels turned upright to serve as cocktail tables and with a wine storage area. I tried the red blend first, along with what turned out to be a fantastic slice of duck. Since the duck didn’t require a ticket or token, I suppose I was free to take more. It was tempting. But I contented myself with the one piece. As I drank the first glass, I wandered around the space, then made it to a quiet corner, where I was looking out the window just as Russ and Robin came into view. I headed out to meet them, then realized I was probably violating protocol. Sure enough, as I re-entered with them, I was offered new tokens for additional wine, which I explained I didn’t deserve. While Russ and Robin got their pours of the blend, I took a glass of the cab. Then we made our way through to one of the cocktail barrels, where we set our plates and glasses down and commenced to talk. It’s not every day you get to meet an e-pal of several years standing. What a delight! * She and Leslie have figured out the secret to a happy retirement. They do so many exciting things, and set a great example. *Yes, in case you’re wondering, it’s true. As part of our e-paldom, Robin is a regular visitor to Ron’s View, which means she’ll be reading this post. But that’s not why I’m calling our time together a delight. Rather, I’m saying so because it was. I only wish Gail could have come. And fellow e-pal Leslie, too, whom I hope to meet when they’re both here in August. The wine? Yes, pretty good. I lack a suitable vocabulary. And as good as it is, I couldn’t help thinking that it’s still very young. Not that I’m an expert on such things. But I figure it will need to sit three years at least before it begins to mature. On the wall just to the side of the doorway leading to the room with the cocktail barrels, there was a framed menu of a 2011 White House dinner at which the 2005 cab was served. Perhaps that’s confirmation that a three-year wait is about right. Once we were done with our wine, I turned in my ticket for dessert, which was a small chocolate cake cylinder with a peanut-buttery filling and a tiny scoop of vanilla ice cream on top. Excellent. Then we headed out the door and over to the main building to pick up our wine. It’s a vast space, with barrel storage to one side and tanks to the other, leading into a smaller space where people were waiting to take our names and give us our orders, already boxed up. We carried them out to the street, said goodbye, and went to our cars. Forty minutes later, I was home. Big day tomorrow. As new “private members” of Quilceda Creek Vintners, we’ll have the opportunit to purchase bottles from their latest release, the 2010 Quilceda Creek Cabernet Sauvignon Columbia Valley. We got notification in the mail ten days ago. When the letter came with the news, I had no memory that I had signed up. I didn’t even remember their existence. Then I went to the website and saw that they’re based in Snohomish—my friend Russ’s stomping grounds. That’s when I realized that the bottle of wine Russ brought us a couple of years ago must have been Quilceda Creek. And we must have liked it, leading me to sign up for a shot at their annual allocation. A query to Russ confirmed this. 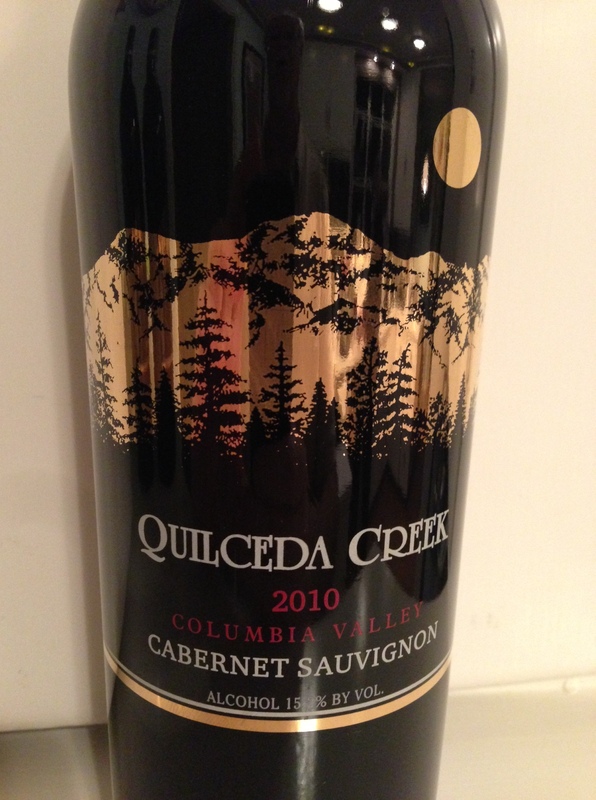 We are pleased to announce the private release of the 2010 Quilceda Creek Cabernet Sauvignon Columbia Valley. The 2010 growing season started with bud break arriving on schedule in early April. Then, a cool, wet spring led to delayed flowering and reduced fruit set, resulting in naturally low yields. The cool summer produced dramatic differences between warmer and cooler sites throughout the state. Our vineyards are located in two of the hottest AVA’s for this very reason. The result is a classic Cabernet Sauvignon. 2010 marks the 32nd vintage of Quilceda Creek Cabernet Sauvignon. Winemaker Paul Golitzin describes the 2010 Quilceda Creek Cabernet Sauvignon as having a rich, velvety mouth feel. It is filled with layers of dark chocolate covered black cherry, blackberry and plum fruit with exotic nuances of Tahitian vanilla bean, violet pastilles and Asian spices. Its seamless integration of all its component parts makes it approachable now, but will age effortlessly for 20+ years. Mind you, this stuff isn’t cheap. Not at $135 a bottle, which would be more than we’ve ever spent for wine. But I trust Russ, who moreover explained that “the real reason to purchase the supreme stuff is getting allocation for their ‘Columbia Valley Red Wine’. It is a blend, almost always strongly cab and could be called cab, made from the barrels that they don’t put into the $135 bottles.” And it costs only $35 per bottle. The $135 bottles are the price of admission for the cheaper ones. Is it worth it? I have no idea how to assess worth when it comes to wine. But we may as well give it a try and see what we think. Of course, we’ll have to lay our purchase down for a few years, so we won’t have an answer for a while. I wrote recently about our delightful dinner two weeks ago at ART Restaurant, mentioning in passing that accompanying the food was a bottle of McCrea Cellars 2006 Sirocco. McCrea describes itself as “Washington State’s premier Rhone varietal winery.” Their list of current releases are what one would expect: syrah, grenache, mourvedre, counoise, and so on. Closer inspection shows that their wines aren’t pure varietals. Each is a blend to some degree, with the named grape predominating. The 2008 Grenache, for instance, is 81% grenache, with 7% syrah, 5% each of counoise and cinsault, and 2% mourvèdre. The 2006 Sirocco stands out as a more balanced blend: 41% mourvèdre, 36% grenache, 13% syrah, and again 5% each counoise and cinsault. In mid-October, we ordered a half-bottle at Jak’s Grill, being fans of southern Rhone wines, and were pleasantly surprised by its quality. I made a note to explore McCrea’s wines further, and when we saw a bottle of their Grenache at our local grocery store a couple of days later, we bought it. It was good, but we didn’t enjoy it as much as the Sirocco. Our dinner at ART gave us the opportunity to try the Sirocco once again, finding it even better than we remembered. Not to mention that at $28 retail list price, it’s a lot lot cheaper than a bottle of our preferred Rhone wine, Le Vieux Télégraphe Chateauneuf-du-Pape. The McCrea Cellars winery is located in a lovely country setting with a stunning view of Mt. Rainier. We’re a half-hour from Olympia, the State capital, and benefit from being only about an hour [and a half] south of Seattle, with its many fine restaurants, markets, and cultural riches. Our lush, green maritime zone has a moderate climate with warm summers and occasional winter snow. Puget Sound is very close, offering superb boating, while in the opposite direction, Mt. Rainier provides outstanding alpine hiking, and only about an hour from the winery. These are the reasons we live here, rather than across the Cascades at our vineyards. It’s worth the three hour drive, a beautiful one at that, and it’s great having a business that’s a “tale of two worlds”, the verdant environment of Western Washington and the expansive, dramatic, desert setting of Eastern Washington. Both our home and winery are located on a twenty-acre property, so our lifestyle resembles that of many European winemaking families. It’s handy to simply walk a few hundred feet down the hill to the winery at any time necessary. Most of the property will remain untouched, however, we plan to plant a small vineyard on a rather steep, south-facing, rocky hillside below the facility. We’ve pioneered Rhône varietals in Washington for over two decades. In partnership with several dedicated growers, we began with a vision, believing that these grape vines would succeed in an unproven region. Today ten varietals thrive, an unprecedented achievement in our State. The wines from these plantings have exceptional quality and accurately reflect the distinctive flavors of their Rhône Valley predecessors. Our story is not about a winery alone, but about relationships with inspired growers who believe in our passion and were willing to take risk. Championing these grapes has required perseverance and careful site selection to assure their survival in Eastern Washington’s cold winters. The State’s volcanic, glacial soils, combined with the arid, desert climate provide an ideal setting for complex, fruit-driven wines. We’re very proud to be at the forefront of this remarkable adventure. McCrea Cellars is owned and operated by two couples. Doug and Kim McCrea have their home at the winery site with their two sons, Kevin and Kalen. Sales & Marketing Manager Susan Neel lives in West Seattle with her husband Bob who serves as our operations manager and chief engineer. We don’t get to West Seattle too often, and I wasn’t clear on whether the Neels stock wine there, but it’s only about a half hour from our house. Better yet, if we find ourselves at Sea-Tac (our airport), we can get to West Seattle by taking only a slight detour on our way home. Indeed, we’ve made a tradition of this, stopping for breakfasts at Easy Street Cafe, pastries at Bakery Nouveau, or whatever else strikes our fancy. Today, McCrea Cellars struck our fancy. We would be heading down to Sea-Tac in the late morning to drop Joel off for his flight home. I reviewed the McCrea website, called the Neels, and asked if it’s possible to buy wine directly from them. Susan said sure, but she would be out in the afternoon. She could, however, take my information and leave the wine for us to pick up. As we talked, Bob checked their stock to confirm that they had a case of Sirocco. Susan explained my options, including joining their wine club. That would give me a 15% case/club discount and the opportunity to get two shipments a year. And they’re flexible: take what they choose, or whatever we want. In my previous visits to the McCrea website, I had considered joining the club. But we don’t want too many club memberships, or we’ll be getting daily notices of shipments with the need for one of us to be home to sign for delivery. I mentioned this to Susan, who pointed out that they’re out delivering wine around the area three days a week. They could simply drop the wine off at our house. No need to sign. No need to pay for shipping. How can we say no to that? So it is that we are now members of the McCrea wine club and owners of a case of 2006 Sirocco. After we dropped Joel, we found our way through West Seattle to the Neel home, where Bob happened to be out sweeping the porch steps as we arrived. We said hi and he told us about the open house wine tastings they have from time to time. Then we were on our way. As a bonus, on this beautifully sunny winter day, we had the most breathtaking views over Puget Sound to the Olympics. Plus, as we descended from the heights of West Seattle onto the West Seattle Bridge, we came on the sight of Mount Baker (one of the dramatic volcanic peaks of the Cascade range, some 90 miles to the north) sitting behind the Space Needle. No doubt this is a familiar, though perhaps infrequent, image for West Seattle locals, but it was a new one to me. The bridge consistently offers some of the best views around. Too bad I was driving. I’ll report again on McCrea after we attend one of the wine tastings.